China, 2000 years ago. Loyang has risen to become the capital of the Han Dynasty and one of the four main capitals of ancient China. In the booming economic climate, the people of this flourishing city require an improved supply of basic foodstuffs. These are supplied by local farmers who grow wheat, pumpkins, turnips, cabbage, beans and leeks in their fields. After each harvest, the farmers regularly meet at the Gates of Loyang to trade their produce. They make deliveries to their regular customers and sell vegetables to casual customers for lucrative profit. But vegetables can also be bartered at market stalls or used as seed to plant new fields. If the farmers need vegetables which they don’t have on hand, they can buy them at their shop. Twenty different kinds of helpers, each with different skills, are available to assist them. These helpers allow players to employ a wide range of strategies and tactics. The most successful farmer will be the one who makes the most progress on the Path of Prosperity within the given time frame. Each step along the path costs money – less to begin with, increasingly higher amounts later on. But money is also needed for investments – so it is crucial to strike the right balance. This is game that both my wife and I love. We are big Uwe Rosenberg fans and this is one of his oft forgotten gems. Although it plays 2-4 players, it really plays best with two. You are a vegetable trader trying to grow, harvest, and sell vegetables at the highest price. Each turn begins with a harvest. There are four different types of cards (Market stalls, Helpers, Regular Customers, and Casual Customers) that you receive two of during the card phase. These cards are used to help sell the vegetables you harvested at the greatest profit. Helpers give special abilities and Market Stalls help you to be able to exchange vegetables you have for ones you want. You sell vegetables to either Casual or Regular customers. These customers provide the tension in the game. Regular customers must be served every round or suffer a penalty. Casual customers can be served at any time (or not at all), but you receive a two coin penalty if you have more Casual than Regular customers. Finding the balance of who to serve when is really important. I love the tension in the this game. Once you learn to play, it is easy to remember. We can easily play a game in 45 minutes even if it has been a while since we played. Even though you are doing the same thing again and again, the cards are always different and your play really revolves around the cards you get. Highly recommended for those who like a good puzzle to solve. 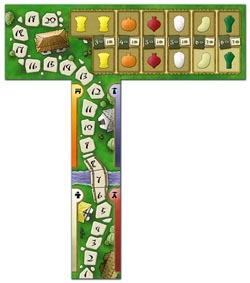 Harvest, trade and sell vegetables in this economic puzzle with an interesting card mechanic. The art of the cards and the game boards suits the Chinese theme very well. The wooden vegetables are cute! The rule book is excellent. Rules may seem a bit complicated, but after one play you will get it. I like this game more than the big farming games of Uwe Rosenberg. The game is less fiddly and not a brainburner (definitely less options than Caverna). Loyang is still a challenging and thinky game. It is also a nice solo game. The gameplay is mostly solitary, down time might be an issue with more players. Try out this less known Rosenberg-game! Add a Review for "At the Gates of Loyang"